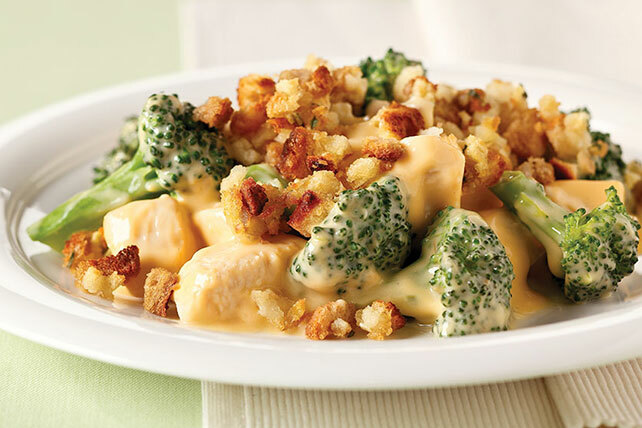 Find a new family favorite with our Cheesy Chicken and Broccoli Bake! Watch this chicken and broccoli bake video to see how the delicious dish is made. Combine remaining ingredients; spoon into 13x9-inch baking dish sprayed with cooking spray. Top with stuffing. Bake 40 min. or until chicken is done. Save 30 calories and 4g of fat, including 3g of sat fat, per serving by preparing with 2% Milk VELVEETA. Substitute 3/4 cup CHEEZ WHIZ Cheese Dip for the cubed VELVEETA. Substitute your favorite frozen mixed vegetables for the broccoli florets.